Soft fur and and soft skin, Cuteness in abundance !!! What looks like a weird ‘hair-do’ is just a bushy vine with flowers. Cute boy, but the cat is taking too much space in the pic. Actually, the composition of the picture is just right for “Cute Caturday”. We are much closer to the animals than we want to know. 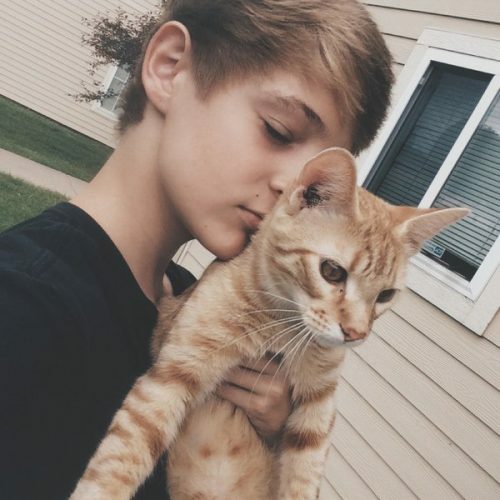 beautiful picture of tenderness and human beauty : simply, a cute teenager holding his beloved cat : GREAT! Thank You for posting it. Cats might you want. Cats you might want to love and to love to go to sleep with. PURR. Claw. Bite. Meow. Gnaw. Purr. Slurp. And sleep, With you. Each cat do have sleeps on me. – Beware the little creatures of the wild which also like that cat of yours. And which might night time might bite your body less seductively. fleas and spiders and other bugs like blood too. PLEASE make sure your cat is not of infect. LYME disease is of infect also. – Cats do have have all alike like this stinky body, M / F, to sleep on and with. Love cats, all of them, until … another story.